The US-led coalition against the Islamic State group says it has carried out a series of air strikes in Syria on its main stronghold, Raqqa. 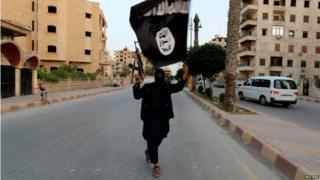 The city is seen by the militants as the capital of the "caliphate" they declared in Syria and Iraq in 2014. The US military described the 16 strikes as one of the largest assaults carried out in Syria so far. The Syrian Observatory for Human Rights said at least 23 IS members were killed in the attack. The London-based monitoring group also said a US drone strike on a Raqqa school on Saturday killed six civilians, including a child. US military spokesman Lt Col Thomas Gilleran said: "The significant air strikes tonight were executed to deny Daesh [IS] the ability to move military capabilities throughout Syria and into Iraq." The raids follow the release of a video, apparently by IS, showing 25 men being shot dead in the ancient Syrian city of Palmyra. Stills from the video showed the killers appeared to be young teenagers. What difference could Syria IS strikes make? Elsewhere in Syria, government forces are reported to have entered the town of Zabadani, as they attempt to retake it from non-IS Sunni Muslim rebels. The Syrian troops (loyal to the government of President Bashar al-Assad) are being supported by the Lebanese Shia Muslim militant group, Hezbollah. Zabadani is close to Syria's border with Lebanon. The BBC's correspondent in Beirut, Jim Muir, says that the Syrian regime is determined to regain control of the strategic town once and for all, as is Hezbollah. It wants to be sure that Shia communities on the Lebanese side of the border will be safe from attack by the Syrian rebels, who are mainly Sunnis, our correspondent says. In this area they are led by the Nusra Front, an offshoot of al-Qaeda in Syria.